This pass gets you into a variety of museums and activities in Strasbourg. If you're going to be in Strasbourg for a couple of days and want to see a number of sights, you would do well to buy a Strasbourg Pass. The Pass is good for three days and provides free admission to some places and reduced prices for others. Current price is 14,90€. We also visited one museum for free (6€) and a second one for half price (3€). The Strasbourg Pass also offers a free half-day bike rental and reductions on tours and audioguides. You can buy the pass at the Tourist Information Office, just across from the Cathédrale Notre-Dame de Strasbourg. 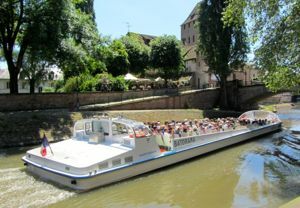 Below, Boat tour passing through the Petite France area of Strasbourg.